That is a little program that I purchased several years ago and continue to use to backup our most important Mac. The home Mac. I started back with our white plastic iMac from 2005 that had a gradual power board issue many years later. The backup drive created by Super Duper was not only a backup of files it was much more. It was a fully Bootable copy of the original hard drive. This was important, because it gave us a way to keep using those user accounts to get work done while obtaining another iMac. That is the magic of one of Super Duper's backup options. My final exam for our two presidential candidates at Oakland University: Tuition 101.
on the rising costs for our students. Why students take so long to complete their "four-year" programs. Why full-time tuition is about $13,000 per year in 2017 compared to just $1,200 in 1980. I paid $1,200 in 1980 myself at a Canadian University in my 1st year as an undergraduate. OU students paid the same. 1. Why do you think that the majority of students at this and other universities take 6+ years to obtain a "four year" degree? 2. Full time tuition was $1,200 in 1980 at Oakland University for the entire year (Fall plus Winter). Its now over $13,000 per year in 2017. What is your explanation for that? 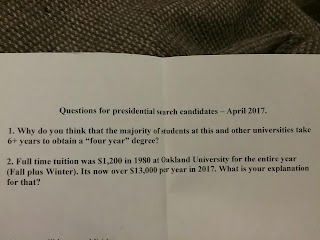 Not only are these questions cutting to the core of the biggest problem students face in 2017, college affordability, they are important questions for two candidates who have no recent experience in the administration at an academic public university such as Oakland. Both candidates, Ora Hirsch Pescovitz, MD, and Carl Camden PhD, are very successful in their career paths as administrators and leaders, and I am in no position to criticize their accomplishments in any way. However, if either one of them becomes Oakland University's next president, there are unique problems regarding high student tuition and they need to understand where that problem originates. I am writing this in my general science education blog because I think it is important information for almost any parent of a current or future college student in the United States. The final marks on my quiz was 50% for both of the candidates. They tied. Both had a good answer for question 1, but not for question 2. I was not surprised because of their career experience. Neither have administered at a public university, over purely academic departments and programs, and so I would not necessarily expect them to know. But I wish them to learn something new that a future president of Oakland University needs to face. Most parents of students, students, and most politicians would also not have an answer for question 2. Both answered that students are working many more hours in 2017, and so have less courses completed per year. Carl Camden kind of suggested that this might also reflect more students going to school while in a career or job, with families. He referred to some of his own employees at Kelly. However, while those kinds of students have always existed, the reality is that our undergraduate student population is not actually a lot older, they are simply taking less courses because it is so expensive that they cannot afford what was called full-time status in the 1980's. When Ora, Carl or myself were undergraduate students, that was often 4 or 5 different courses taken at the same time each term. Way back then, most students completed a "four year" degree in 4 to 5 years. In the United States of 2017 this is now well over 6 years. In the 80's, if our parents did not have extra funds for our college, we could bank our next year's tuition simply by working during the summer. Students now have to work all year long in 2017, more than 20 hours per week during the school year, just to afford the fewer courses they enroll in. 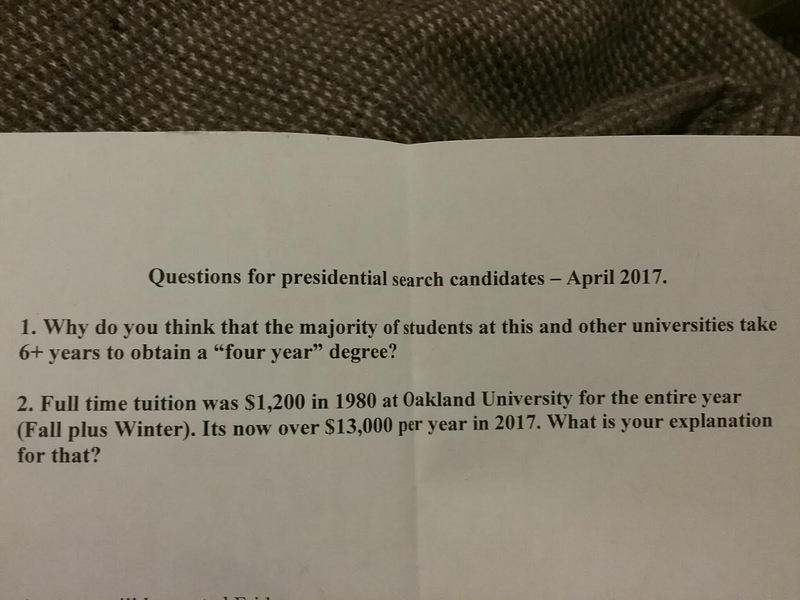 As for question 2), neither candidate seemed familiar, nor did they understand the numerical realities of why tuition is so large now in 2017. This might be expected since neither candidate comes to us from an academic career in the sense of a public university like Oakland. They come to us from private corporate careers. Carl Camden was once a full time professor but that experience ended long before the dramatic changes to our tuition and education cost structure set in. Ora Pescovitz was with the U-Mich health system for years, which is owned by a state university, but her work was mostly within a clinical hospital system. To be fair, most of our state's politicians are also unaware of why tuition is so high. Politicians are so oblivious to the reasons that they do not even seem to understand how they are actually the cause of most of our higher tuition costs in 2017. They even accuse universities of gouging students, which is just plain wrong. So, what is the answer to question 2? That rate has increased the cost of living, pay, cars, houses, services and goods in similar percentages over the last 37 years. The same inflation rate applies to my salary as a professor, most of the support staff, and the costs of construction. However, if we applied this accumulated inflation rate to a $1,200 tuition of 1980, this would calculate a tuition of $3,500 in 2017. But, tuition is over $13,000. Where is that extra $9,500 coming from? Higher pay for professors? No it is not that. Anyone can look up average professor salaries from any time and see that they have not exceeded values explained by economic inflation. Is it newer technology then? Nope. Not that either. While technology in the 1980s looks clunky compared to 2017, a good IBM Selectric typewriter, and the first models of IBM PCs without graphic cards were as relatively costly as a MacBook Pro is today. We do have a much higher percentage of higher level administrators than in the 80s, and they come with big six-figure salaries and increase cost, but another force seems to drive student tuition well beyond even that effect. That force is our own state governments, who we do elect, and a relative divestment in post-secondary education over the last three decades. While we paid a $1,200 tuition in 1980, that was NOT our total education cost per student. In other words, our tuition did not cover even most of our education cost. It only covered about 25% of our education cost. The other 75% came from the State. That is why many persons of my age (mid 50s) who sit in our state house and senate were able to graduate without very much student debt. Especially if we attended a university near home. Our education cost per student was about $4,800 in 1980, and students paid about $1,200 of that as tuition. Applying the inflation rate to $4,800 then predicts an education cost of about $14,200 today. The education cost at OU now is more like $15,800. So a bit more may be accounted for by the large shift to larger numbers of high level administrators that has happened at many American universities over the last 20 years. But most of the education costs is just as one should expected from regular inflation rate that has acted across the whole US economy. What has changed, is that our state government, and many other state governments, have dramatically shifted how they cut the education cost pie with our students. In 1980, OU students paid about 25% of their education cost. In 2017 students pay about 82% of their education cost! Michigan, and many other states, have divested in education cost contributions. While legislators will point to an increase in the absolute dollar values of money provided per student over the last few decades, in reality that number is falling way behind as a percentage of education costs that it covers. Salaries and gross national product have increased with inflation too and if the same percentage of those salaries and profits were taxed and channeled to education costs as they were in 1980, then those contributions could cover 70% of a student's education cost and our undergraduates at Oakland University would be paying a tuition more like $5,000 per year, or even less. The most important challenge for public university presidents in 2017. So the point I want to make to any future president of Oakland University, presidents of any other public state university, and to their governing Boards, is that someone needs to start educating the parents of our students and our legislators how our State's relative divestment in higher education has increased tuition its highest level ever in 2017. Professors are really very tired of hearing politicians accuse Oakland University or Wayne State or EMU of "gouging" students when tuition is increased beyond Michigan State Government's recommended tuition cap. There is simply no choice. A university either gets the money to pay their operations or they turn off the lights and close their doors. Its simple. Our next president, should they come from the private sector, needs to understand this fundamental problem of funding student education at OU and many other public Universities. They must be thinking about how to team up with Board members and Faculty, get to Lansing, and be vocal about the truth in tuition numbers. Until these numbers change, students will continue to take well over 6 years to complete their traditional four-year degree programs, and a high percentage of students will drop out and fail to complete their degrees. Those that complete will have burdensome levels of student loan debt. Students will continue to go to our general undergraduate advising offices and be told that they should take more courses, like 16 hours per week, to get done sooner and generate less debt. Those students will continue to come to our labs and offices where we find them crying, wondering how they hell they can stop working 20+ hours per week, buy more courses and reduce their final debt? Many universities are making the mistake of trying to push students to enroll in more courses like that will solve their problem, and it does not. It just makes more of them depressed and ready to drop out. 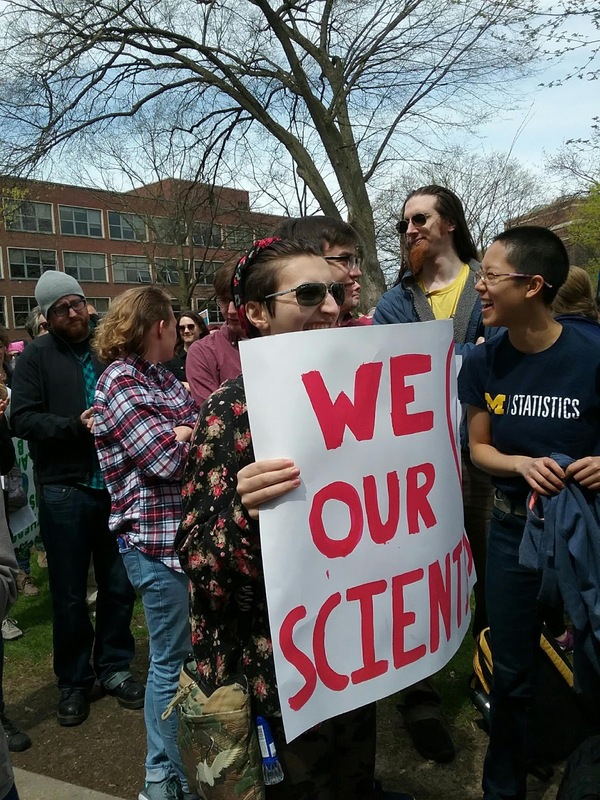 It is time to take a hint from the Science March that took took place, and go to Lansing and show them the numbers, and start educating all Michigan families about why their kid's tuition is so high. I am in Ann Arbor. Check out March For Science on Google Play! I will continue to update the App to help keep awareness and traffic headed towards these fine science march groups. I have a feeling we scientists need to be educating the public 365 days per year. That is why I have kept this blog. The March for Science was just a start. This is a week of science awareness for everyone of us to ponder what we can do to make sure we do more to let everyone benefit from science knowledge and the good we can do with it. Why to March for Science: We Live and Breath in our own Fish Tank. 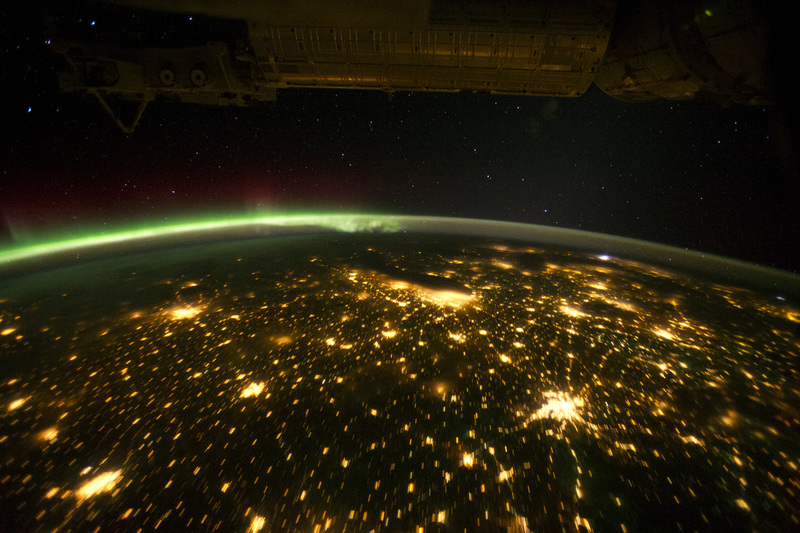 The aurora borealis, the northern lights, green here as viewed from the international space station (ISS). The large blob of yellow light, in the middle, comes from the Chicago metropolitan area. You can read more about this amazing photo at NASA's - Earth Observatory website, and see the same image with the locations of US cities indicated. (Can you also spot the lightning occurring?) Kind of reminds you of that Star Trek movie where Jean Luc and the gang go back in time and reverse the Borg take over of the Earth, where the "Borg Earth" looked pretty much like this photograph. We are everywhere. NASA has produced a composite global map of night sky ground lights from human activity. These data can be used to map energy consumption, study growth of infrastructure and populations and more.